Published by Tatra banka a.s. 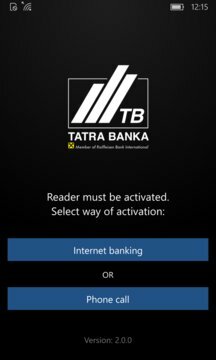 The reader is dedicated to Tatra banka clients with activated Internet banking service who are using Windows Phone (from version 7.1) and Windows (from version 10). It serves to generate codes for exampe for activation of application Tatra banka, logging in Internet banking (desktop version) and confirmation of payments. The reader is also as secure as the standard tool Card & Reader. Thanks to functionality QR code, the application simplifies retyping data from Internet bankinguTB. The application does not require for its function active data services, voice services and sends no SMS messages. The application requires access to the camera due to scan QR codes from the Internet bankinguTB. 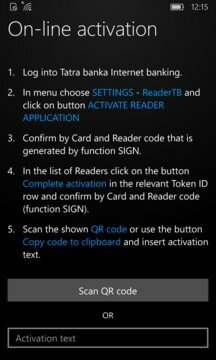 Activation of application is available through the Internet bankinguTB (tab "Settings"), or via the Dialog LIVE contact center. After entering the activation text (captured the QR code from the Internet bankinguTB) and entering the password for the first login, you will be prompted to change your password. Strenght of password (entropy) is evaluated in password creating process, so the more difficult password you choose, the longer you do not have to change it. Further use after activation requires only the created password for the application.